Flightline AC, Inc. contracts the production of this DC brushless compressor to the necessary specifications. Unique to Flightline AC is the ability to have a compressor that has no external moving parts. The benefits to you as the user of our system is that there is no belt to wear or break, no 2nd electrical motor to provide power to, and performance that is unmatched for the weight that is added to the aircraft. Pictured is our tm compressor assembly for the unique baggage arrangement in the LancAir IV. For other vehicles including Viper Jet, RV-10, Velocity, and others we have the ability to place this compressor in a space allotment of 1 cubic foot, anywhere space allows in the aircraft to help adjust or control CG. Epic owners will have our first dual system with dual zone controls. With the flexability offered by this technology, we can provide 8,500 to 30,000 BTU to your cabin space and even more with dual units. The total electric requirements for most systems is as little as <45 amps at 28 volts. Humidity, ambient heat load, and restrictive pressure against the blower and condenser motors, all raise the amp draw on any system, so please read about our other components in order understand that we address the power consumption issue from every possible direction. There has been a lot of speculation and misinformation concerning the electric compressor. Engineering truth is engineering truth. Somethings we know all there is to know. Other things we are adding new theory to what was previously known and building on our new discoveries and failures and designing much greater effieciency into our newer designs. The latter is true of air conditioning compressors as well as electric motors. Two types of systems are used for producing air conditioning from electricity. 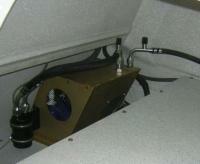 The first utilizes an electric motor that drives an automotive compressor with a belt. This type of system is very effective as an airconditioning unit, but to this date the electrical requirements to turn the compressor and effectively cool large cabin space with high heat sink is far too great without voltage changes greater than 28 volts or currency draws in excess of 65 Amps. The second type of system is modeled after the hermetically sealed design in cold storage units (refrigerators and freezers). High voltage and current draw have also been a problem for these units until rotary and scroll compressor technology had some very incredible engineering advances over the last 5 years. Flightline's systems are custom manufactured in DC brushless models that we can then use in a number of ways that was not previously possible. Coupling the advances of our compressor design to the advances in heat exchanger technology, allow once unsatifactory technology to be the best pound for pound producer for air conditioning. Flightline's advances in air conditioning technology allow 28 volts to produce what other manufacturer's require 48 volts and 100 amps to produce. Flightline utilizes the variable voltage conditions of our compressors to maximize their efficiency at 28 volts. Still capable of operation within the 20 to 50 voltage range, 28 volts has been maximized because of our desire to not require higher or mixed voltage in an aircraft. Combine Flightline's electric compressor with our evaporator and our multi-pass, parrellel flow condenser technology, and you have a complete system weighing only 50 lbs that requires 45 amps, with higher capability than that of units weighing 65-85 lbs using 48 volts and 65-100 amps.